Google announced a second-generation Nexus 7, which retains the screen size, but increases the resolution tremendously to 1920 x 1200 pixels. This continues the affordable slate’s role as yardstick for other portable Android tablets to be measured against. But how does it stack up against Apple’s portable tablet warrior – the iPad mini? Should you rush to the Google Play Store to get one to replace your first-gen Nexus 7? We’ve prepared a quick comparison table that’ll bring you another step closer to making the decision. For starters, the new Nexus 7 is thinner and a tad lighter than its predecessor. As a result it’s more comfortable to operate with one hand. It’s still 10 grams heavier than the iPad mini, but Apple’s portable tablet is 2cm wider, so things balance out in terms of handling there. We mentioned the screen resolution, and here neither the iPad mini, nor the first-gen Nexus 7 can hold a candle to Nexus 7 2′s WUXGA display. Its pixel density is almost double that of the iPad mini’s. Portable tablets not only need to be easy to handle, but also cheap to buy. Google asks $30 more for the Nexus 7 2 than it did with the original, but it’s still not even close to the premium charged by the Apple offering. Check out the table below to see how the Nexus 7 2 stacks up against the iPad mini and the first-gen Nexus 7. That’s Google’s latest Nexus 7 slate in a nutshell and just like the original, it sets the bar pretty high for other portable Android tablets and gives the competition a tough time. 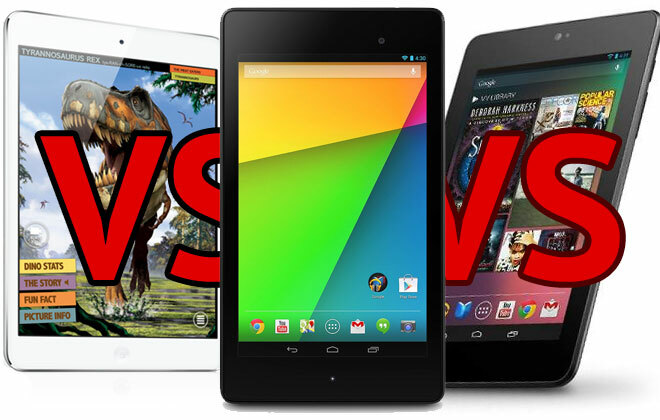 Feel free to share your opinion on the Google Nexus 7 2 in the comments section below.